Why: Cisco is interested in the LineSider technology for rapid network provisioning software, as well as for its workforce of engineers. 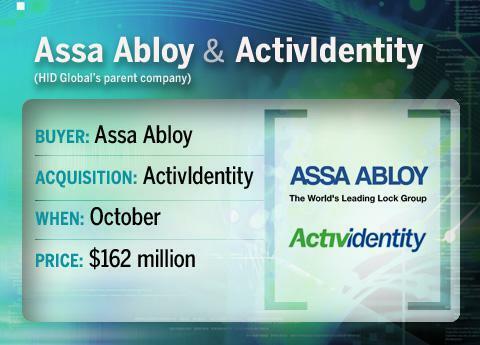 Both will help in Cisco's pursuit of the fledgling cloud market. 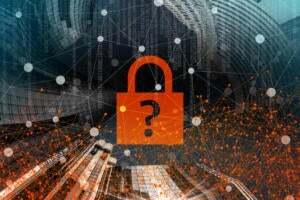 Why: Expands Trend Micro's encryption portfolio to include privately held Mobile Armor's full/disk, file-folder and revocable media encryption for endpoints. Why: The deal will give Mellanox more scale as well as penetration into verticals such as financial services and energy. 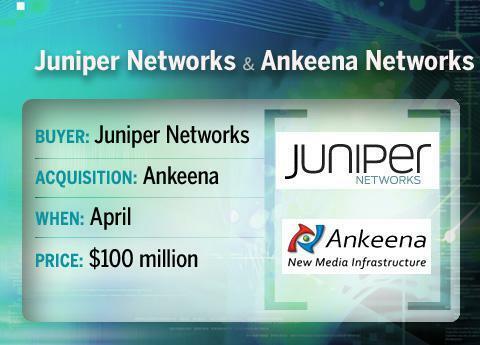 Both companies are best known for their InfiniBand interconnect technologies, but also sell Ethernet-based products. Why: Red Hat plans to use Makara technologies as part of its Cloud Foundations portfolio. When combined with Red Hat JBoss Enterprise Middleware, the Makara platform could allow additional monitoring, rollback and scaling tools. Why: Isilon's NAS systems will be aligned with EMC's Atmos object storage products to provide a low-cost, scalable platform for managing large amounts of "Big Data," an industry term referring to the growing flood of information generated by utilities, online media companies and other verticals, according to a statement. 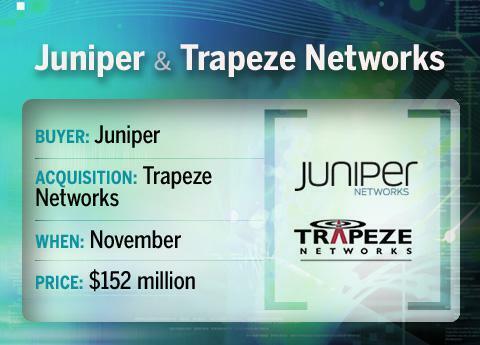 Why: The purchase fills a gaping hole – wireless LANs -- in Juniper's enterprise networking portfolio. Why: Fleshes out Attachmate's management software portfolio with Novell's workload and desktop management technologies, as well as open source technology. 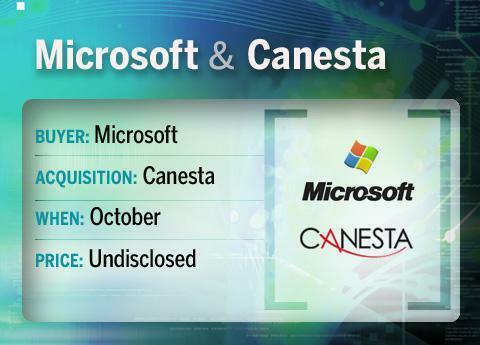 (A Microsoft-led consortium also snagged Novell intellectual property worth $450 million). Novell had rejected an unsolicited bid from a New York hedge fund earlier in the year that Novell management felt undervalued the onetime network industry leader's assets. Why: Enables open source data integration vendor Talend to expand its service-oriented architecture offerings via Sopera's open source enterprise service bus and other technologies. Why: Expands Quests data protection product portfolio with real-time data protection, deduplication and replication offerings, as well as tape and disk-based recovery and backup products. 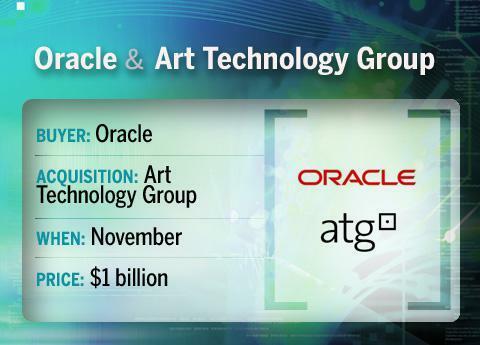 Why: ATG's e-commerce technology will be "highly complementary" to Oracle's existing lineup of CRM, ERP and other software, according to Oracle. Why: Boomi provides services to simplify deployment and management of cloud-based applications alongside existing on-premise applications. 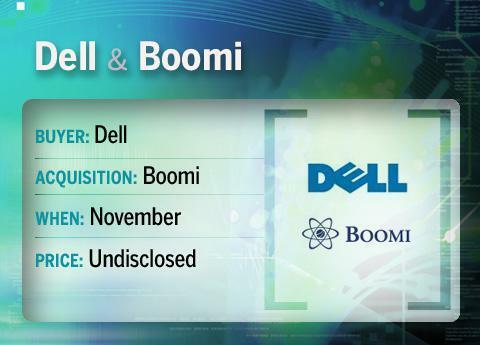 For Dell, the acquisition is a step ahead in building a stronger portfolio of products as more businesses move toward Web-based computing. Why: Genesis offers video-based services to broadcasters, producers and aggregators of specialized programming, so buyout is designed to enable Global Crossing to address more specialized video requirements from customers. Why: Mobile connectivity with corporate PBXs via cellular and Wi-Fi. Why: Clarity's financial governance software will bolster IBM's analytics software portfolio. IBM has spent $14 billion on companies in this area over the past few years. Why: Purchase of the single sign-on company strengthens Oracle's security offerings across enterprise, cloud and mobility platforms. Why: To gain additional capabilities focused on convergence of physical and logical access. Why: AVIcode's application monitoring software for .Net applications will boost Microsoft's System Center management software and its Windows Azure cloud business. Why: Company makes software that simplifies typing on touchscreen phones and devices, including Android devices and Apple iPhones and iPads. Why: Provides Red Band, a mobile software management company, with mobile virtualization software for x86 and Arm processors designed to make software development and updating faster and cheaper. Why: Alcatel-Lucent's latest push into the mobile application space, where it hopes to become the middleman between service providers and developers. OpenPlug is the creator of ELIPS Studio, a tool that allows developers to write an application once, and then translate it into native code that can run on iPhones and Android-based smartphones. Why: The acquisition could help Intel grow faster in the high-volume smartphone market, where the company has minimal presence. Most smartphones today carry chips designed by rival Arm, and Intel has had its eye on the smartphone market as the volume of chips for mobile devices outpaces traditional CPUs that go into PCs. Why: HP says Stratavia's technologies will help enterprise customers to simplify the deployment and management of applications in hybrid IT environments, including physical, virtual and cloud environments. Why: Bolsters Google's presence in social networking and mobile gaming. Why: Enrique Rodriguez, senior vice president and general manager in Cisco's Service Provider Video Technology Group: "ExtendMedia will strengthen Cisco's position in the delivery of IP video services by enabling service providers to provide a more interactive and personal experience and to optimize quality for consumer viewing devices." Why: Motorola is interested in using 280 North's technology and expertise to develop Android applications. Why: Integrien makes real-time performance analytics software that will help VMware customers simplify and automate the management of virtual infrastructure. 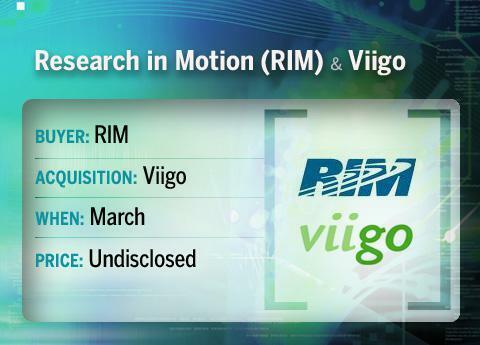 Why: Provides RIM with back-end infrastructure technology that could be used to improve its mobile applications store. Why: TriCipher helps secure software-as-a-service applications and in-house apps with a single sign-on system that controls access to both internal and external IT resources. Why: Nokia hopes to use Motally's mobile analytics tools to make it easier for developers and publishers to "optimize the development of their mobile applications through increased understanding of how users engage." Why: To integrate McAfee security software with Intel hardware to provide consistent embedded security across networked devices ranging from smartphones to servers to cars. Why: 3Par sells a storage virtualization technology that allows companies to reduce the volume of storage they need to allocate to run their applications. 3Par President and CEO David Scott said in a statement that being part of HP will allow 3Par's products to "truly thrive." HP beat out Dell in a bidding war for the acquisition. Why: Arbor's security software, including anti-distributed DoS and botnet offerings, complement Tektronix's network management tools for service providers. Why: Bolster Google's efforts in social networking, gaming. Why: To augment St. Bernard's security appliances with both Red Condor's hosted content-filtering services and a gain of 1,900 customers, with an eye toward building hybrid managed security offerings, especially for cloud environments. Why: To further McAfee's mobile security strategy. 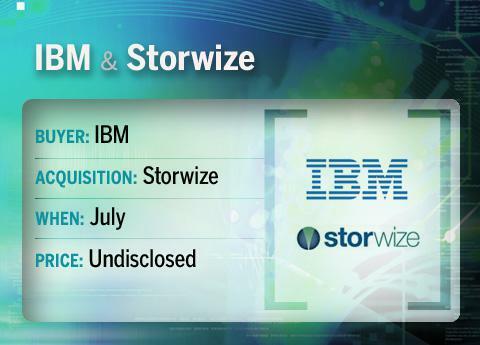 Why: IBM says that Storwize's compression technology will help scan more historical data for analysis without the need for extra storage, which could help boost the performance of analytics applications and databases. Why: Ocarina makes appliances and software that perform data compression and deduplication on unstructured data such as images and e-mail. The company's technology will complement Dell's EqualLogic enterprise storage arrays, Dell said. Why: Nokia Siemens will acquire manufacturing operations for all the major wireless systems, including GSM (Global System for Mobile Communications), CDMA (Code-Division Multiple Access), WCDMA (Wideband Code-Division Multiple Access), WiMax and LTE (Long-Term Evolution). Why: Webroot indicated it values BrightCloud’s Web content classification technologies, which it has already used in an OEM relationship. Why: GFI indicated it wants to use Sunbelt's VIPRE anti-malware technology in its security product line, and Sunbelt said development and sales would benefit from GFI's capital resources and market channels worldwide. Why: Brings IBM automated mass patching from the data center for a host of business devices; IBM had already integrated much of BigFix's technology into its own services. Why: Brings tools for managing physical and virtual servers into Dell's data center management portfolio. 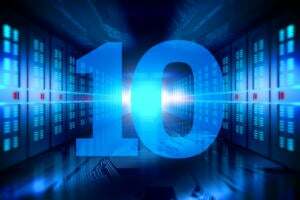 Dell had already been offering Scalent's technology via an OEM deal. Why: Expansion into cloud-based online backup and storage in order to let consumers and small businesses access data from computer and handheld devices. Why: Adds digital rights management expertise to Check Point's lineup. Why: To enhance Cisco's consumer product development road map by providing design and development consultation. 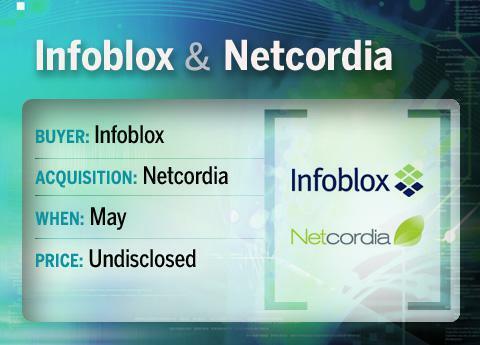 Why: IP address management, DNS and DHCP vendor Infoblox will add Netcordia's network change and configuration management technology to its portfolio to further enable Infoblox's network infrastructure automation strategy. Why: HP's point of view, it gives them a position in the fast growing mobile device market, and Palm's WebOS is seen as good technology. As for Palm, it needed a buyer to give it any chance of going up against stronger players such as Apple, RIM and Microsoft. Why: Gives Google more control over a partner that makes Web widgets used by Google on its iGoogle personalized homepage service. Labpixies has made a name for itself with game apps, including Flood-it! Pro. Why: McAfee intends to take Singapore-based tenCube's WaveSecure consumer-oriented mobile smartphone security software/service for Android, Blackberry, Symbian, Windows Mobile, iPhone and Java-powered feature phones and expand it beyond its base of half a million customers largely in Asia. The service focuses on location, back-up and wipe technologies, but may eventually be integrated with other McAfee mobile security technologies. Why: Offers voice- and AI-driven personal assistant technology to the iPhone. Why: Apple liked what it saw in Intrinsity technology, which is widely-believed to be instrumental in the A4 processor that powers the iPad. Intrinsity makes design tools for building efficient processors. 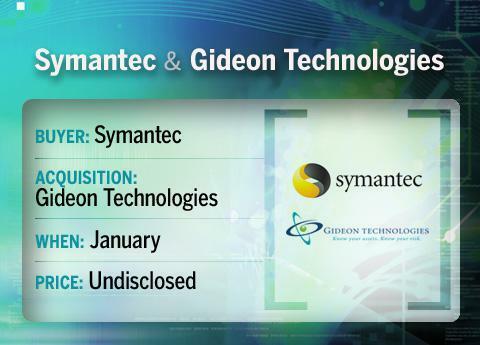 Why: Symantec, which had a close relationship with GuardianEdge through a licensing arrangement, bought the privately held company for its encryption products and customer base in the government and financial sector. 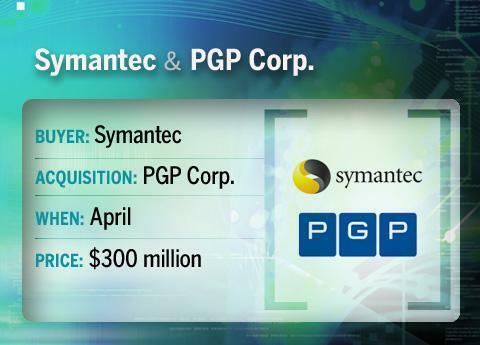 Why: Symantec wants PGP for its encryption technologies, in particular that of key management, and its customer base. 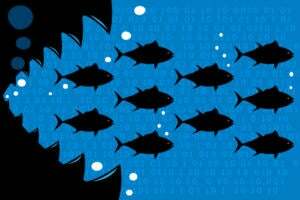 Why: NetApp's acquisition of this storage virtualization vendor will improve the company's object-based storage capabilities. 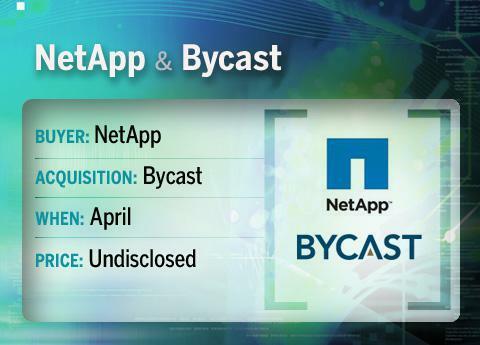 Bycast's software is "designed to manage petabyte-scale, globally distributed repositories of images, video, and records for enterprises and service providers," NetApp said. Why: Rabbit's open source messaging platform is used to deliver messages between applications and various types of IT systems, and will boost VMware's cloud computing technology. Why: To optimize mobile and fixed networks for efficient video and media delivery to smartphones and other mobile devices. Why : Viigo, a developer of software that delivers syndicated content to mobile phones, enhances application support on BlackBerry devices. Why: Lets Google offer an online component to Microsoft Word before Microsoft does so itself; complements Google Docs online services. Why: CA will use Nimsoft's IT service assurance software in its product strategy to manage cloud computing environments and cloud-based services. CA will also be able to sell to some 800 Nimsoft customers, 300 of which are MSPs and mostly greenfield accounts for CA. Why: VMware will integrate RTO Software's management tools into its desktop and application virtualization products, making it easier for individual desktop users to access personalized settings. 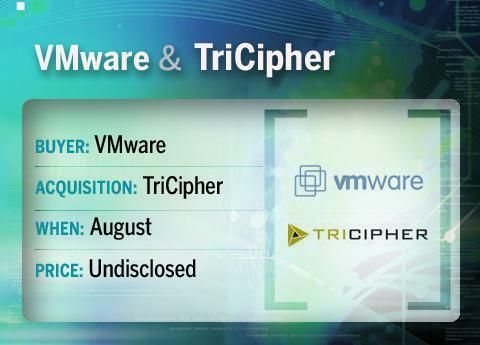 RTO's technology will be integrated into VMware View in mid-2010. Why: CA will bring 3Tera's AppLogic technology in-house, offering service provider and enterprise customers tools to move existing applications into private and public cloud environments. Why: Mimosa's on-premises NearPoint platform is known for its ability to archive Microsoft Exchange e-mail, SharePoint data and unstructured files. 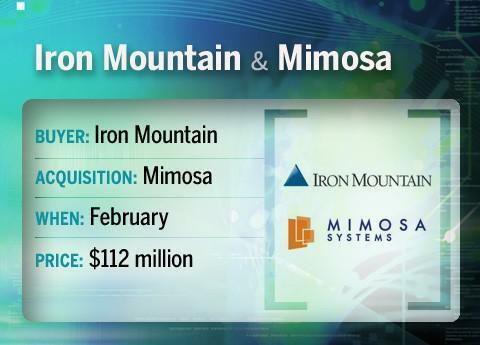 It will work alongside Iron Mountain's array of software as a service archiving offerings. 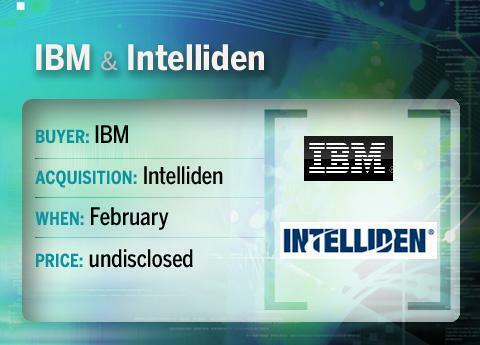 Why: Intelliden's network automation software will be integrated into IBM's Tivoli group to help customers automate configuration of network devices such as hubs, routers and switches. Why: "Aleri is a major player in event processing in financial services. Financial services is Sybase's largest vertical market and is also the largest vertical market for event processing," said Gartner analyst Roy Schulte. CEP software monitors the torrent of transactions that occur in a company's IT landscape in real time, looking for patterns and correlations and triggering alerts or corrective actions if needed. Why: Master data refers to classes of information such as products or suppliers that are common to a number of systems and applications within a company. MDM software is used to make sure master data entities are kept consistent and accurate. Initiate's particular strengths lie in the healthcare and government sectors, IBM said. There are multiple styles of MDM that address different scenarios, and IBM expects customers will ultimately deploy more than one MDM system. Why: SolarWinds will integrate the storage resource management capabilities and products from Tek-Tools’ Profiler suite into its own Orion network monitoring and management suite to provide customers with end-to-end management of network, application and storage performance in virtualized IT environments. Why: BMC will incorporate Phurnace's Deliver technology into its BladeLogic Server Automation Suite, providing customers with automated application release management capabilities that would reduce the cost and complexity of deploying Java-based applications on physical, virtual and cloud environments. 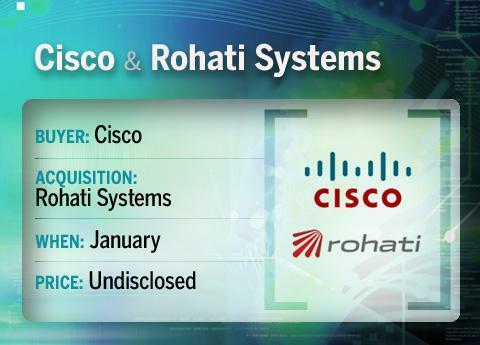 Why: Rohati, started by former Cisco engineers in 2008, has developed cloud security technology that's expected to find application in Cisco's Nexus switch line. Why: For its encryption technology, to be integrated into Trustwave's endpoint-security offering. Why: For its Security Content Automation Protocol validating and vulnerability-assessment technology. 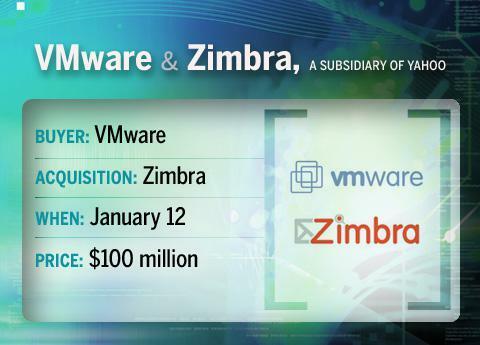 Why: VMware has designs on Zimbra, an open-source messaging platform, as another brick in the construction of its cloud strategy, an orchestrated move "up the stack" to provide capabilities beyond virtualization. Following its April 2009 acquisition of SpringSource, an open-source collecton of Web application development and management tools, VMware is quickly going about creating a base platform-as-a-service offering to challenge Microsoft, Cisco, IBM/Lotus and Google. Why: Archer's GRC (governance, risk and compliance) products will be merged with EMC's RSA Security Division to help customers better maintain and enforce company policies across virtualized and physical infrastructures. Why: Blade specializes in blade and top-of-rack switches that connect racks of servers to other data center resources, such as storage arrays. 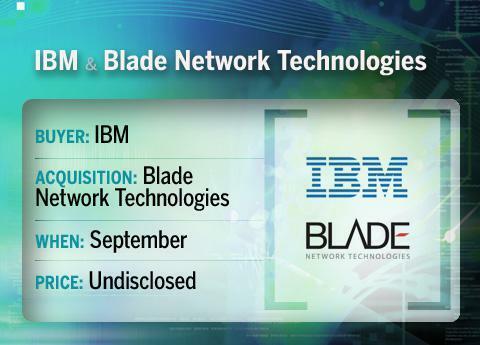 The deal expands IBM's data center portfolio into networking and heightens competition with rivals HP, Dell and Cisco. Why: GridApp's Clarity software is already plugged into BMC's BladeLogic Server Automation platform, and will strengthen BMC's existing technologies for cloud life-cycle management. Why: Provides content protection and video/audio optimization technologies to Google to support increased demand for streaming video. 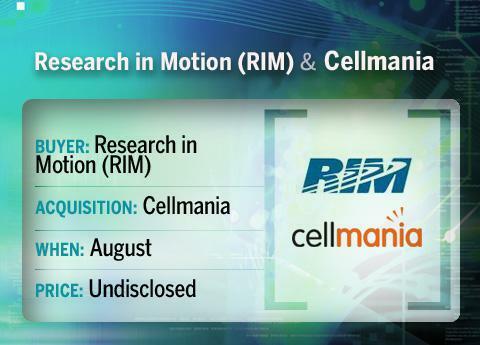 Why: Brings mobile user interface and embedded technology expertise to BlackBerry maker RIM. Why: For securing the physical and virtual assets of virtualized data centers. Altor VF, the company's virtual firewall, is designed to stop malware outbreaks in VMs and attacks on the hypervisor, and prevent workloads with different security requirements from being mixed on the same host server. Why: Siemens Enterprise wants to add FastViewer's multimedia conferencing and collaboration software to its OpenScape unified communications offerings. The Fastviewer software will be sold under the name OpenScape Web Collaboration. 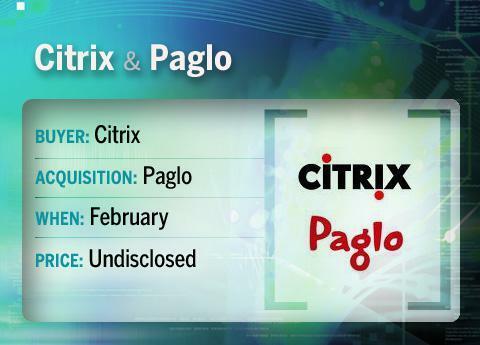 Why: Acquiring the German maker of online meeting software will enable Citrix to attack that market in Europe more aggressively. Why: To expand its range of enterprise storage products with Compellent's virtualized storage offerings, which offer thin provisioning and tiering. 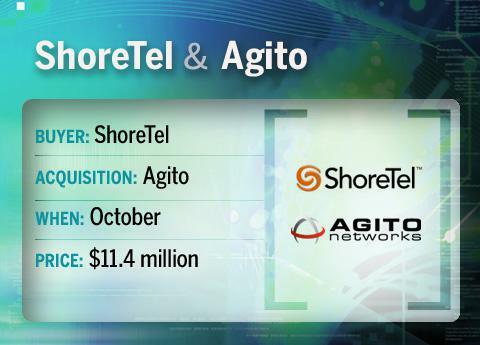 Why: Buying the phone and Web service provider will further expand Earthlink's services for business customers as the company moves further away from its consumer business.